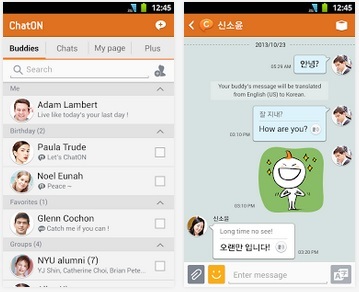 Samsung has updated the Android version of ChatON — its cross-platform mobile messaging service — with support for SMS and MMS. Users who download the newest version of the app will now see their phone’s native messages combined with their ChatON messages inside the app. ChatON is by no means the only app offering this feature: Google’s Hangouts service recently added it, Facebook Messenger for Android has included the feature for over a year, and there are dedicated SMS apps for Android. Samsung says the new feature “offers the best performance” on the Galaxy S3 and S4, and Galaxy Note 2 and 3 smartphones, but it supports other phones running Android Ice Cream Sandwich or higher. The feature is not available on iOS or other versions of ChatON.